The Cleveland Browns begin their 2015 season this Sunday against the New York Jets but some fans are already focusing in the 2016 NFL Draft before a single game has even been played. Why you may ask? For the 6’5 250 pound gun slinger from The Ohio State University, Cardale Jones. Jones has captured the hearts of many Browns fans who want to #FailForCardale after his masterful performances in his four career starts. They’re willing to “tank” the season in hopes to land the talented quarterback known as “12 Gauge”. I’m going to give you a case for why the Browns should and why they shouldn’t #FailForCardale. Why they should: The Browns have struggled to find a franchise quarterback since their return in 1999. They’ve drafted a quarterback first overall (Tim Couch), they’ve tried trading up for a quarterback (Johnny Manziel, Brandon Weeden, Brady Quinn), they’ve tried bringing in a veteran quarterback (Kelly Holcomb, Jeff Garcia, Jake Delhomme, Brian Hoyer) and they’ve tried developing a quarterback (Charlie Frye, Colt McCoy) and it hasn’t worked out right. Although Manziel is in his second season with the team, he’s been making more headlines off the field than on the field. He struggled in his two starts last season and will start the season as backup to veteran Josh McCown. The Browns need to keep trying to find the quarterback who can lead the franchise to sustained success for the next 10-15 years. It still might be Manziel but I wouldn’t bet on it at this point. Jones has the ideal size to be an NFL quarterback especially in the AFC North where Steelers quarterback Ben Roethlisberger has the same body type as Jones. He’s got a durable frame and has been able to take and dish out hits. He’s got great arm strength that can make all the throws, he’s mobile to where he can take off and scramble and make plays with his feet. He would be the perfect quarterback the Browns are looking for. Ray Farmer and Mike Pettine are both heading into their second seasons as the general manager and head coach of the Browns organization. After going 7-9 last season, one would think they would like to continue building upon last season. I don’t think throwing in the season would be a good idea especially with the “trigger finger” owner Jimmy Haslam has. He fired Rob Chudzinski, Joe Banner and Michael Lombardi after one season and it wouldn’t shock me if Haslam fired both Farmer and Pettine if a disappointing season were to occur. Also, veterans like Joe Thomas, Joe Haden and Alex Mack have been around for a long time and have seen enough losing in their careers. If the plan was to “tank” the season, it wouldn’t set well with the locker room in my opinion. As it pertains to Jones, he’s only started four games so it’s still a little early to decide whether or not he’ll be even a top ten pick in the NFL Draft. Although many draft experts including Bleacher Report’s Matt Miller has him as one of the top quarterbacks in the 2016 draft class, they’re basing it off potential. As much as I like Cardale Jones and even though i’ve tweeted out the hashtag on social media. 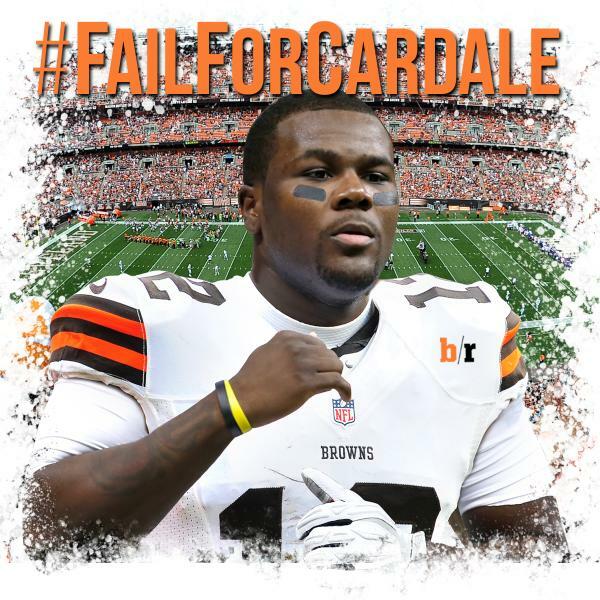 I don’t want the Browns to #FailForCardale. I want to see the Browns win as many games as possible this season and not “tank”. I believe in Ray Farmer and Mike Pettine and what they’re building in Cleveland. See what Josh McCown has at quarterback and if he struggles, put Johnny Manziel in and see what you got with him too. He still might surprise people and show promise. Don’t throw the entire season away just to the first pick in the draft. You can find a quarterback anywhere in the draft. The Packers drafted Aaron Rodgers at the bottom of the first round. The Seahawks drafted Russell Wilson in the third round. The Patriots drafted Tom Brady in the sixth round. The Cowboys signed Tony Romo as an undrafted rookie. The Browns will find their franchise quarterback eventually, just a matter of where and when.